Dover, DE – Governor Jack Markell’s fourth State of the State address today made clear that to lead in the future, Delaware must stay focused now on creating more jobs, making our schools stronger and governing responsibly. 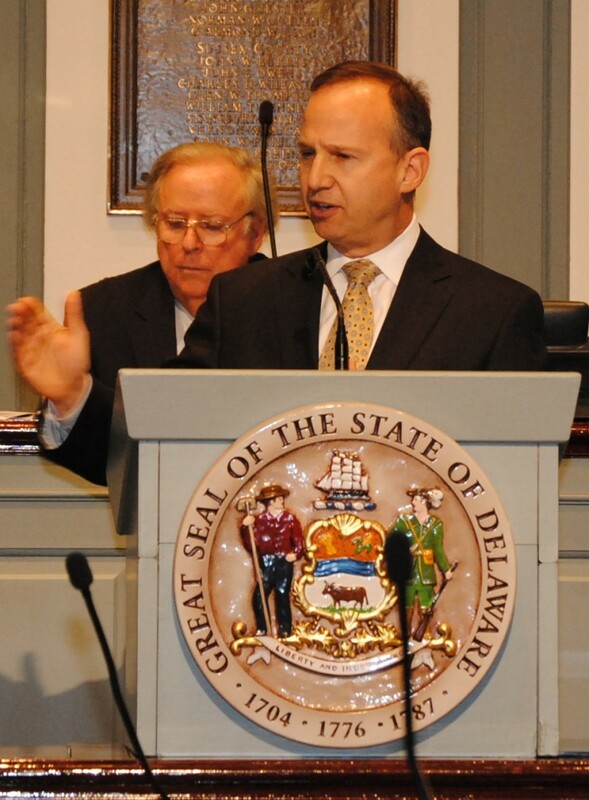 In the speech in the House Chamber, Markell offered new proposals in each critical area and updated the legislature on some successful efforts underway to get people back to work, ensure more Delaware children graduate ready to succeed and make government a sounder steward of state resources. The division and derision that has marked debate in Washington, DC and other governing bodies has been largely absent in Delaware, where citizens and their legislators have pulled together across the state and across partisan lines to keep the state moving forward. The Governor thanked the legislature for their work to set the state up for success. Jobs and economic growth have been, and remain, the administration’s top priority. “Winning the turns” means continuing to make progress with the state’s ongoing efforts at job creation, including fully funding the Strategic Fund, which has helped attract and retain jobs at significant employers like PBF Energy, Sallie Mae, Baltimore Air Coil, Fisker Automotive, Miller Metal, Bloom Energy, Mountaire Farms and Capital One; investing in infrastructure, including the use of the Delaware Infrastructure Fund to attract businesses expansion efforts like Amazon.com; and continuing to modernize the Port of Wilmington to increase our capacity to handle global trade. It means demonstrating that economic development and environmental protection are compatible goals through existing efforts that have modernized our energy fleet while reducing air pollution by 8,600 tons per year of nitrogen oxide and 33,000 tons per year of sulfur dioxide (equivalent of taking 450,000 cars off the road); and connecting people with the First State’s history and natural beauty including the launch of the First State Trails and Pathways Plan, a $13 million effort to build miles of new and enhanced trails throughout the state for every Delawarean to enjoy. Seizing Delaware’s time to lead also means adopting new efforts to get people back to work now and in the future by focusing on small businesses. This includes further supporting emerging start-ups and growing companies by applying best practices found at entrepreneurial support centers across the country and helping existing small businesses get access to credit through the federalSmall Business Credit Initiative. The state is pursuing innovative ways to give small businesses the edge, including the first statewide partnership with Facebook to help Delaware companies fully engage the powerful potential of social media. For their work, the Governor also recognized two members of the Delaware National Guard in the audience, Sergeant Bruce Sevens of Dover and Senior Airman Jason Duricek of Wilmington, both of whom served in Afghanistan. Delaware recently added representation of veteran-owned businesses to our Supplier Diversity Council, to ensure that they have a fair opportunity to compete for state business. To encourage the private sector to hire returning veterans, the Governor proposed expanding tax credits to Delaware businesses that hire veterans. Just as a businesses’ greatest asset in growth is its people, the state’s greatest asset for economic growth can be its workforce. Keeping the state’s commitment to the strongest possible public schools provides significant economic benefits now and in the future. The state has made significant commitments to making schools stronger, including a reform plan that won national recognition through the first Race to the Top Competition. Working together, parents, teachers, administrators, private employers, foundations and public officials haveestablished high standards to ensure an honest understanding of what is necessary for success in the global economy; improved the assessment system so parents and teachers can track student progress and identify student needs quickly; supported teachers with resources to help them student achievement; and made progress on evaluations for teachers based in part on the progress students make. Over the past year, Delaware has also launched a World Language Expansion Initiative, increasing opportunities to study the languages needed for global competitiveness and making completion of a world language a graduation requirement. The Governor further proposed to create partial immersion programs in twenty schools over the next five years. To press forward, the Governor emphasized the importance of implementing without additional delay the state’s Performance Appraisal System, which has been crafted with the advice of hundreds of Delaware teachers. As a parent, he highlighted the need to ensure that these efforts help children develop a love for learning that inspires their imaginations and creativity, and committed to working with the Delaware State Teachers Association and the state’s business community on a new effort to raise awareness of the truly great things that are happening in Delaware classrooms. Delaware announced historic investments in early childhood education during the spring of 2011, and the state was recognized for these plans with significant federal funding through the Race to the Top Early Learning Challenge in December. The plan, which Delawareans are working together to implement, includes (1) the professionals who care for Delaware’s children will have the proper training; (2) the early childcare facilities will have the best teaching and learning tools; and (3) the successes and challenges of centers will be closely monitored to ensure continual improvement. The Governor indicated that the state aims to raise the percentage of high-need children in quality-rated programs from 20 percent to nearly 80 percent over the next four years and committed to introducing a new kindergarten assessment through collaboration with the Delaware State Teachers Association and many kindergarten teachers. To succeed, Delaware needs to invest in business-supporting infrastructure, quality of life, our children, and our workforce. Governor Markell emphasized that responsible governance is critical to ensuring the effectiveness of these investments. Government transparency took several steps forward in 2011, with streamlined procedures for responding to requests for public records from the executive branch. The Governor called on counties, towns and school districts to join this commitment to ensuring citizens have access to information, and he commended the General Assembly for their significant progress over the past three years. To build on this progress towards greater transparency, Governor Markell announced that the administration would work with President Pro Tempore DeLuca and Speaker Gilligan, and Majority Leaders Blevins and Schwartzkopf to implement a new online reporting tool where citizens can see which lobbyists are advocating for clients on specific pieces of legislation. The Governor has worked with state agencies and Legislators to make government more efficientthrough initiatives like the “I Found it Cheaper” website for state procurement, eliminate more than a thousand executive branch positions, slashed the state vehicle fleet, renegotiated leased space, and stopped unnecessary printing. In 2011, leaders from both parties and representatives of employees worked together—in contrast to the pitched battles in other states—to confront the unsustainable long-term costs of state employee pension and health plans, saving more than $480 million over the next 15 years. Further efforts to increase efficiency are needed, including reforms to the criminal justice system. Through the Justice Reinvestment Initiative, state officials are continuing to review opportunities to improve investments to achieve greater impact. Governor Markell also highlighted health care as the cost driver that “looms above all others and will swamp all the savings we achieve elsewhere if not addressed.” State Medicaid spending increased by $56 million for the Fiscal 2012 budget, and the proposed increase for 2013 will be $21.7 million. Because the Medicaid population combined with State employees and retirees represents nearly 40 percent of the health insurance market in Delaware, the Governor committed to work with the Delaware Medical Society, the Delaware Healthcare Association, and the community to insist onincentives for providers that are aligned to improve quality and discourage waste. Some progress has already been made: starting April 1st, Delaware will replace a traditional reliance on institutional care for seniors with a strong emphasis on community living. State agencies are also coordinating efforts to improve the quality and reduce the cost of care for those who have traditionally been cared for in the state hospital and young people aging out of foster care. The Governor discussed the need to encourage individuals to take responsibility for making healthy choices by building on efforts begun by the Governor’s Council on Health Promotion and Disease Prevention, the Sussex Outdoors Initiative, Delaware institutions of higher education, and others. He also announced that state campuses will become smoke-free. Transcript of the Governor’s 2012 State of the State message.